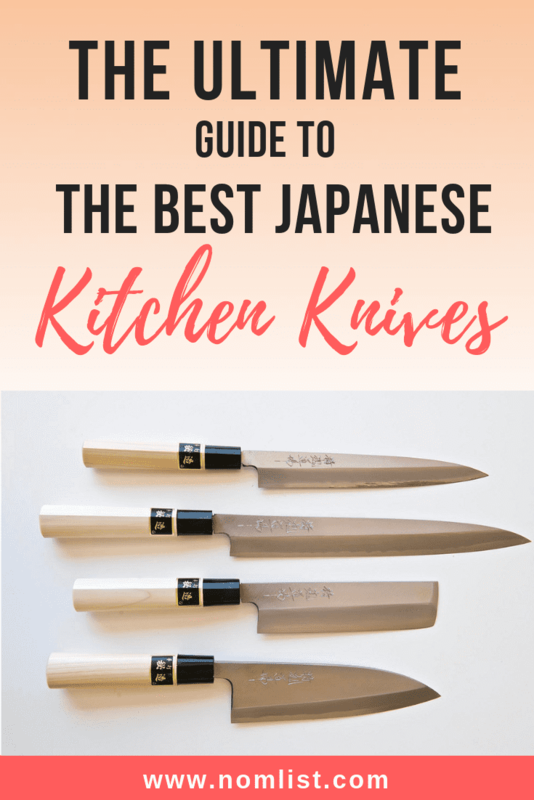 The Ultimate Guide to Best Japanese Kitchen Knives – every kind you’ll need! What is the one item that defines a chef in the kitchen? It could arguably be the quality of their knife. Whether you’re a master chef or a budding artisan, a knife can say a lot about how you prepare dishes in the kitchen. Is the knife easy to maintain? Some kitchen knives fall apart easily and others are prone to scratches or constant sharpening. You will never have to worry about those problems if you invest in a Japanese kitchen knife. But, the options can be daunting, considering there are several different kinds. Choosing a knife is very personal, yet very important. You would want one that’s comfortable, sharp, and has a quality design. Of course, you would want to be careful in your selection of a knife you will presumably use almost every day. The best Japanese kitchen knife for you, may be a different knife for someone else. If you are looking for other knives, we've also reviewed bread knives, ceramic knives, fish fillet knives, and boning knives. So, I have compiled this guide to the best Japanese kitchen knives for your convenience. The Yoshihiro VG10 is hands down the best Gyuto Japanese kitchen knife, especially since it is perfect for beginner chefs. These knives are skillfully produced by only the finest Japanese knife artisans and for that reason: aren’t massed produced. However, the sixteen layers of outer steel is an impressive work of art. It is hammered to give it a unique look. It has a stainless steel center core. You can trust that this knife will not be getting any scratches and surely won’t be slipping out of your hand. The handle is made of mahogany and features a full tang, which also means the life of this knife is extended. If you are looking for a larger Gyuto knife than the previous model, then the Dalstrong is perfect for you. Since it has a longer blade, this knife also features a stronger larger handle. The blade features a full tang, which promises longevity. This super steel blade is cooled with nitrogen, a process known as Honbazuke. This method of cooling steel enhances this blade’s primary features: flexibility, durability, and corrosion resistance. This Japanese chef’s knife is made of forty-five layers of high carbon stainless steel for amazing durability, which is why we included it with the best Japanese kitchen knives. It has a tsunami rose damascus signature pattern that is recognizable. If you want to make sure you are noticed in the kitchen and recognized as a superior chef, this knife has got you covered. The blade is nonstick and has been designed to allow you to cut freely using a simple rocking motion. The handle is slightly curved and triple riveted, for added longevity. It boasts having a razor sharp blade and angle to cut through virtually anything you are preparing in the kitchen. What’s more is that the Zelite Infinity comes with a leather sheath, which just proves further how keen this company is on quality. If you’re looking for a shorter bladed Japanese chef’s knife, then the Shun DM0706 will be perfect for you. Even though it’s shorter, we included the Shun on the list of the best Japanese kitchen knives because it still has superior quality, but it’s a little less artsy. This knife would be for you if you are looking for a knife that chops veggies and meats perfectly, but doesn’t have the ornate finishes that the previous models have. It is made of thirty-two layers of high carbon steel and is rust resistant. It has a black laminated handle that is ergonomically designed to fit comfortably in your hand. The blade has been hand sharpened and is ready to use. As you may have noticed when knife shopping, specific Japanese vegetable knives tend to look a little different. They have more of a rectangular shape. Usuba means: thin blade. This knife is so delicate, although looks so bulky. It can slice perfectly through fruits and vegetables without damaging their skin. The blade is made from high carbon steel that is rust resistant. The handle is ergonomically designed and is made from Pakkawood. Although the knife looks bulkier than a traditional cutting knife, it is extremely light and easy to balance in your hand. This is why we have included it on our list of the best Japanese kitchen knives. Dalstrong makes the list best Japanese kitchen knives list once again, for their impeccable design and attention to detail. The black Pakkawood handle is triple riveted and fits in your hand perfectly. The blade height is perfect to provide optimal knuckle clearance. It’s laminated, polished, and designed for kitchens that need to chop quickly with little effort. The blade is made of high carbon steel that has been hand polished and is ready to chop vegetables as soon as it leaves the box. It is extremely sharp and is 18 degrees on both sides. This knife is perfect for professional use, but is also easy enough to use that it would even be a good investment for a home chef. This serrated utility knife by Zelite Infinity is your new perfect steak knife. But, not only that. This knife can cut through just about anything you throw at it. Keep in mind, if you want a gentler cut, look into the lighter thinner vegetable blades we discussed earlier. This blade features sixty-six layers of high carbon stainless steel and is razor sharp. The handle is rounded and triple riveted, so it will fit into your hand comfortably. If you are looking for precision cutting, look no further. You will notice that when you hold this one of a kind knife in your hand, it is perfectly balanced. Nobody likes having to fight their knife while they are slicing or cutting their meats. These Japanese steak knives by Zelancio just had to be added to the list of the best Japanese kitchen knives because they are different than the Zelite utility knife. They are different because they are not serrated. These knives are crafted from damascus steel and have sixty-seven layers. The surface of these knives is naturally non-stick. These beautifully crafted knives come in a set of four. Zelancio prides themselves on designing knives of professional quality that anyone can use in the kitchen because they are so well crafted and balanced. The handle is made to fit comfortably in your hand and is composed of Pakkawood in a dark grain. These knives are smaller, but would still be an amazing accent piece in your kitchen. Who doesn’t love sushi? Of course, we had to include sushi knives on our list of the best Japanese kitchen knives. If you’re looking for the perfect knife to prepare sushi in your kitchen, look no further than the Sashimi. It is specifically designed to prepare raw fish and sushi. These blades are different in that they are very long and thing, perfect for slicing through fish with little to no effort. You can’t use a regular knife for sushi! If you do, you will damage the cell walls of the fish and alter the taste. This knife uses thirty-three layers of stainless steel and features a black ebony wood handle. The handle features an octagonal design, which is unique but very easy to hold. The Yoshihiro is an excellent alternative to the Sashimi because it offers you a longer blade. If you have a whetstone, that will work perfectly to keep the Yoshihiro sharp. You can easily cut through any type of fish with little to no pressure. We love the Yoshihiro and added it to the list of the best Japanese kitchen knives because it is not mass produced. This beautifully crafted knife is made 100% in Japan. The handle has an octagonal handle and an ebony bolster. This is for added durability and lightweightedness. It features Hongasumi high carbon steel and exceptional sharpness. The blade is also stain resistant. Of course, Dalstrong has to take our number one spot for the best kitchen knife set on our list of the best Japanese kitchen knives. It’s almost common sense due to their top-notch quality and world renowned elegance. This set of six comes with a handmade out of walnut wood block that is called a: dragon spire. It has magnets on both sides of it. This Phantom Series is nitrogen cooled for extra hardness and durability. These blades are flexible, yet corrosion resistant. The handle features a full tang, which is just something we are used to with Dalstrong products. The blades feature a beautiful one-of-a-kind engraving. The blades are amazingly sharp and they would be the perfect addition to a master chef’s kitchen or a home cook. I had never heard of the Orient brand before this knife, assuming you haven’t as well, but I am sure glad I found this knife. First of all, the engraving on both the knife blade and the handle are gorgeous. The blade is extremely sharp, but what makes this product is the attention to detail in the handle. That is why we added it to our list of the best Japanese kitchen knives. The blade is supported by an Ergo-Grip G10 Pro handle that was expertly designed. It was made to have the most comfortable grip to deliver perfect handling and precision when cooking. It makes slicing and dicing a breeze in the kitchen. The Orient has a triple riveted handle for extra durability. If you’re looking for a unique addition when cooking in your kitchen, then this is it. It also comes with a lovely sheath. This knife by EKUER is one of the best Japanese chopping knives we have seen on the market. This knife is high rust resistant and made of damascus steel. If you aren’t sure what to get a chef in your family or want a new chopping knife for yourself, this knife would make a perfect gift. This is because it is easy to maintain and very versatile. Not only can it chop veggies, but it also can go smoothly through meats. The blade of this knife is slightly curved, which allows a steady rocking motion when cutting. The handle is excellent and ergonomically designed. It is able to fit loosely in your hand, but you will still have a firm grip whether the product is wet or dry. We are in love with hand-hammered designs on knives, not only for looks but also because it keeps food from sticking to the blade’s surface. This knife is not only tough enough for carving meat, but is also delicate enough to double as a sushi knife. The thickness of this knife is 2.5mm. This meat carving knife is the perfect gift for the grill master in your life. This carving knife is made up of sixty-six layers of stainless steel that has been folded together. The handle is made out of rosewood. The texture of the handle is natural and fits delicately in your hand. The knife, in our humble opinion, has perfect balance. The TUO blade is perfect for slicing just about anything. The blade is made of forty-four layers of high carbon soft steel and the core is made of Japanese super steel. It is not just rust resistant, but rustproof. It has a hammered finish, so it stays sleek and clean. Not only that, but the reason this knife made the list of best Japanese kitchen knives is because of it’s handle. The handle of this product is military grade strength. This means it will provide you with life-long durability. The handle is hand-polished and shaped to fit perfectly in a hand. You don’t need any knife sharpeners for this product and it is ready to use as soon as it arrives. This Japanese fillet knife may be little, but it sure packs a punch. It is crafted with thirty-three layers of stainless steel for rust-free performance. The blade core is made of high carbon Japanese super steel that allows this fillet knife to hold it’s perfect shape for years to come. The degree of the blade is at a 16 degree angle, making them a breeze to work with. The handle of this product is D-shaped, which allows it to fit in the palm of your hand. The handle is made from durable Pakkawood. The Shun brand is known for deriving it’s blade crafting skills from the ancient art of samurai sword making. For this reason, you can trust that these blades are designed to deliver the ultimate sharpness. This handmade Japanese kitchen knife is made of sixty-seven layers of damascus steel and has a Japanese super steel core. This amazing core allows for this knife to have perfect balance. The hand-folded steel blade is polished by hand to make it as smooth as a mirror. The blade of this knife is rust and corrosion resistant. This product is designed so that even if the handle gets slippery or wet, it will not affect how well you hold onto the handle. That is how ergonomically sound the handle of this product is. It stays sharp for a long time, but when you do need to re-sharpen it, it is quite easy. These handmade knife is perfect for chopping, slicing, and dicing due to it’s incredible sharpness. We have just listed off quite a few Japanese kitchen knives for you to choose from. All this information, however, may be overwhelming if you’re still on the fence on which one to buy. After all, picking products to be a main staple in your kitchen can be kind of daunting. You’d want to make sure the products can perform, but still look the part. If you are looking for a set of knives, or more simply a brand that is exceptional, Dalstrong is the way to go in that department. If you are just specifically looking for a non-flashy smaller knife, try the Shun brand. If you want something a little more ornate, but still sharp as can be, you’ll want to look into the Orient brand. All of these are beautiful, artisan knives!